TextureWatch is a small Blender add-on to automatically synchronize textures used in your .blend file if they change on disk. This simplifies working with external programs like Gimp or Substance Painter because TextureWatch can automatically update those textures when you save your files without the need to go through all images inside Blender one by one and selecting reload. This saves time as well as guarantees consistency. The full documentation is also provided as a PDF file in the distribution package. The add-on will add an Image → Add Texture Watch Entry to the Image menu in the Image/UV-editor. 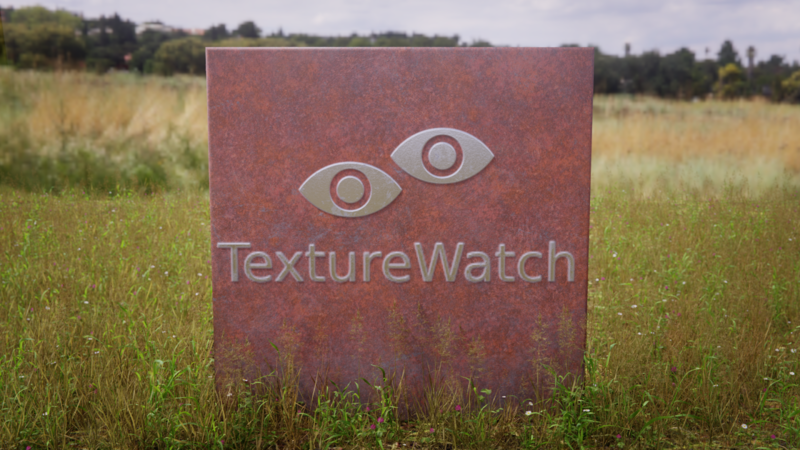 The TextureWatch management panel will be available as a ‘Texture watch’ tab in the tools region of the Node editor (if the tools are not visible press ctrl-T) and in the Texture options. If you want to replace a previous version of TextureWatch you have to remove the old version first. To do this, go to File → User preferences … → Add-ons and either search for TextureWatch or go to the ‘Import-Export’ category where it will be located. Click on the add-on and then on the ‘Remove’ button. After removing the old version follow the instructions above to install the new version. If you have enabled the add-on and kept the default configuration any texture in your scene that is not packed will be automatically added to the watchlist and then monitored for changes on disk. There are however several ways to add and remove textures from this list manually. If you have an image texture in the UV/Image editor and you want to keep it up to date if it changes on disk all you need to do is select Image → Add Texture watch entry and it will be added to the texture watch panel. The texture watch will only be enabled if the image texture is not packed and if the texture has at least 1 user or has a fake user. The texture watch panel itself offers more options to add or remove textures from the list and new textures can be automatically added as well (if enabled, see Automatic addition of entries). The Texture watch panel can be found in the Toolbar of the Node editor (press Ctrl-T if not visible) and/or in the Texture options, depending on your choices in the add-on preferences. The panel shows a list of all textures that are currently monitored for changes on disk. This will add the texture visible in the editor. This menu entry is only enabled if the texture is not packed and has at least one user or a fake user. This will add all textures present that are not packed and have at least one user or a fake user. This will remove the active watch entry from the list. It will no longer be monitored for changes on disk but it will not be deleted from the scene. This will remove all entries from the watch list. If the option automatic addition is enabled in the add-on preferences any image texture that is loaded from disk will be automatically added to the watch list and enabled. Textures that are added automatically will not be added again when removed by hand. By checking/unchecking an item in the watch list you can disable the monitoring of on-disk changes without removing the texture from the list entirely. All items in the list can be enabled or disabled by clicking the or button respectively. Textures that have zero users and no fake user are disabled automatically, as are packed textures and textures that do not have a corresponding file on disk. If the option automatic delete is enabled in the add-on preferences any entry that is automatically disabled will also be removed from the watch list (but not from the blend file). You can customize the behavior of TextureWatch with several options in the add-on preferences. If checked, the Texture watch panel will be available in the Node editor toolbar. If checked, the Texture watch panel will be available in the Texture properties toolbar. If checked, new textures will be added to the list of watched textures automatically. Only textures with at least one user or a fake user will be added, and a texture should not be packed. If checked, watched textures that become invalid because they have zero users and no fake user or are packed, will be removed from the list automatically. The number of seconds TextureWatch will wait for a texture to stop changing. If a texture is changing on disk, TextureWatch will check every second if it has stopped changing. If it has stopped changing or it took more than the number of seconds specified with this option, the texture will be reloaded. The default of 30 seconds is more than enough for most scenarios. Only if you use an external program to edit your textures and writing a single texture takes very long, you might need to increase this value if you don’t see your texture being updated automatically in Blender. The number of seconds TextureWatch will wait before checking for new changes. You might increase this value if your .blend file contains a very large number of textures and you experience performance issues. If checked a lot of debug information is logged on the console. When I add a texture from the UV/Image editor, it is disabled immediately, what’s wrong? Nothing, your texture is probably packed or has zero users and no fake user. Packed images are stored inside your blend file and not on disk so they cannot be changed by an external program. Therefore it makes no sense to watch them. If you have enabled automatic addition in the add-on preferences (on by default) the texture will be enabled as soon as it is unpacked to disk. Will this work with program X? If your texture is stored on disk it doesn’t matter which program is used to change the texture. As soon as you save/export your image or texture set to disk, TextureWatch will detect the change and update the texture inside Blender.